Kay is Jacqueline’s aunt and Mama’s sister, with whom Mama is extremely close. When Mama and the children move to New York, they move in with Kay and her boyfriend, Bernie. Aunt Kay dies from a fall not long after the family moves into the apartment below her. Mama, who was extremely close to Kay, takes her death very hard. The timeline below shows where the character Aunt Kay appears in Brown Girl Dreaming. The colored dots and icons indicate which themes are associated with that appearance. Churchill, Katherine. "Brown Girl Dreaming Characters: Aunt Kay." LitCharts. LitCharts LLC, 7 Feb 2017. Web. 22 Apr 2019. Churchill, Katherine. 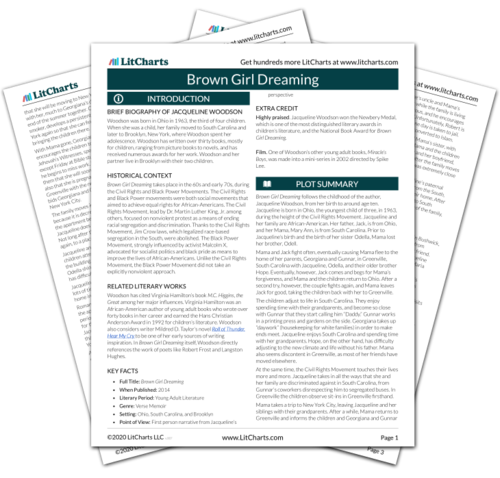 "Brown Girl Dreaming Characters: Aunt Kay." LitCharts LLC, February 7, 2017. Retrieved April 22, 2019. https://www.litcharts.com/lit/brown-girl-dreaming/characters/aunt-kay.